Claim some free spins at Slotastic Casino each day this April 2017 to help celebrate Easter. Make a deposit as little as $15 each day to claim some free spins, but remember, the more you deposit, the more free spins you will receive. Deposit between $15 and $19 and claim 10 added free spins on the Hen House Slot. Make a deposit between $20 and $49 and claim 20 free spins. 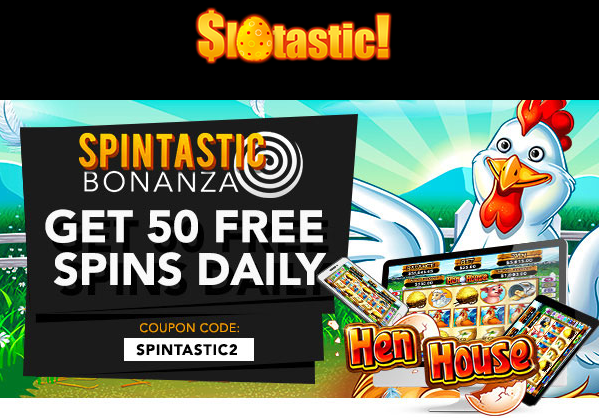 When you deposit $50 or more you can claim the maximum of 50 free spins on the Hen House Slot. Please remember that you can use this bonus once per day on the download, instant play or mobile version of the casino. Don’t miss out on your chance to play with these Slotastic Casino April 2017 Easter daily free spins now. Make your deposit so you can instantly claim your free spins on the Hen House Slot. This entry was posted on 2 April,2017 at 3:04 pm	and is filed under Account Holders, Deposit Bonuses, Free Spins, New Accounts, RTG. You can follow any responses to this entry through the RSS 2.0 feed. You can leave a response, or trackback from your own site.